The name Arts of Mars originates from reference to the Roman God of war, Mars, and so calls to mind all the skills and knowledge needed for war. The first specific mention in period literature was made in a book by the Duke of Newcastle from England in 1639, where he suggested that "All Gentlemen should learn the Arts of Mars". 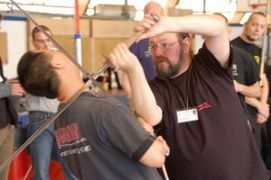 We offer Weekend Seminars, Day Courses and Private Intensive Trainings all over the World for beginners, advanced students for Medieval Wrestling and Dagger, Medieval Sword Fighting, Italian & German Longsword, Cutting with Sharp Swords, I.33 Sword & Buckler and Sword & Shield, Stage Combat, Reenactment and Archery, Self Defense Courses, Courses for Kids and Anti-Agression-Projects. 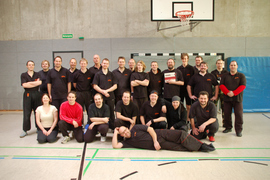 Join one of our 3 groups in the regular Training for Medieval Sword Fighting, Medieval Longsword, Sword & Shield, Medieval Wrestling & Dagger, Long Messer, Back Sword in 2 locations in Hannover, and one in Lauenau. Special Times for beginners set asside for basic training at all venues! Have a look at our shop with our high quality Step-By-Step Learning Books and DVDs for Wrestling & Dagger, Longsword and more as well as Training Equipment like Nylon Swords and of course the Arts of Mars Textiles.